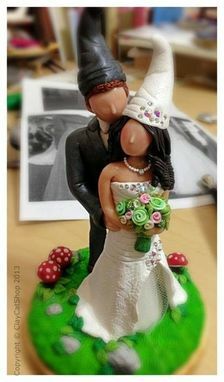 Love gnomes? So do we!!! 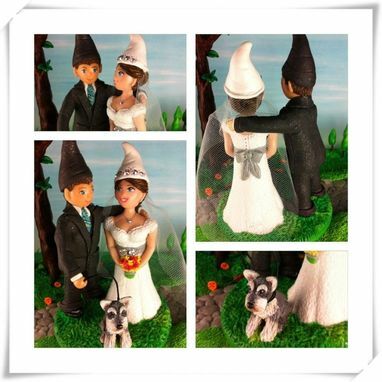 If you are planning a Woodland Style Wedding and are looking for a unique cake topper that will create a statement and bring a warm smile to your heart every time you look at it, we can help you! Please allow a minimum of 4-6 WEEKS for production from the date we receive full payment and have all the information and pictures. Send us as many detailed pictures as you would like. 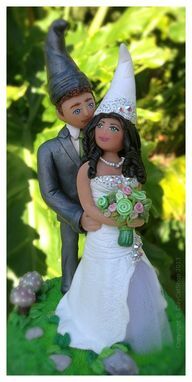 (Dress-suit, close up of bride and groom, anything else you can think of, to help the artist visualize the happy couple). Costs will vary, depending on the complexity of the dress, suit, details, etc. 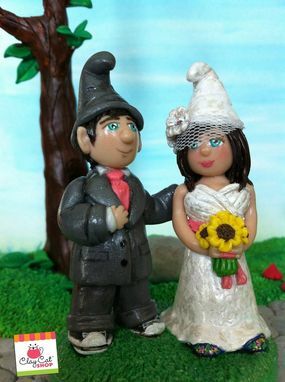 ClayCatShop's sculptures are 100% hand sculpted in polymer clay, without any molds, making all of our work one of a kind, please enjoy the little imperfections that are part of our art. The artist devotes lots of hours (sometimes days), love and attention to every detail in the creation of each piece. Artist has over 18 years of experience.